Lion Corporation (President: Itsuo Hama) announced today the nationwide release of Kaori Tsuzuku (Long-Lasting Fragrance) TOP plus on Wednesday, January 18, 2012. This new super-concentrated liquid laundry detergent containing fabric softeners is blended with Lion's proprietary "double fragrance-keeping component" and natural essential oils to provide a pleasantly long-lasting, abundant fragrance that remains on clothing between wearings. A Lion survey conducted in 2011 revealed that a significant number of consumers have become increasingly focused on detergent fragrances in recent years. In addition to nice fragrances, 29% of respondents' desire detergent fragrances that last until clothes are put on, while 43% prefer such fragrances to continue while clothing is being worn. In addition, approximately 90% of the respondents who emphasize detergent fragrances have a greater desire for scents that last longer than before. This indicates an increased need for detergents that feature continuous scents. However, the survey also revealed that only a small number of respondents believe the products they currently use provide fragrances that last until clothes are put on or while clothing is being worn. Over the past few years, the consumption volume of such synthetic fibers as polyester and polyurethane in the second half of fiscal 20101 is up 130% compared with the second half of fiscal 2008 according to a survey conducted by the Japan Chemical Fibers Association. In particular, although cotton has until now been the main material for undergarments, the use of synthetic fibers is increasing thanks mainly to the development of heat-retention and rapid-drying capabilities. 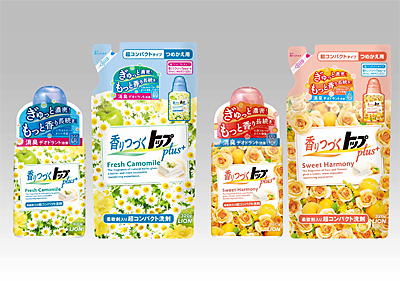 Lion will release Kaori Tsuzuku (Long-Lasting Fragrance) TOP plus, the new super-concentrated liquid laundry detergent containing fabric softeners. This product is blended with Lion's proprietary "double fragrance-keeping component" and natural essential oils to provide a pleasantly long-lasting, abundant fragrance that remains on cotton clothing and towels as well as garments made with synthetic fibers between uses. (1) Kaori Tsuzuku (Long-Lasting Fragrance) TOP plus is blended with Lion's proprietary "double fragrance-keeping component" and natural essential oils. Consequently, the long-lasting, abundant fragrance remains on clothing between wearings. 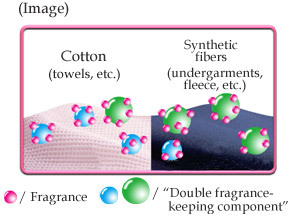 Owing to the use of the "double fragrance-keeping component," the product's pleasant and abundant fragrance remains on cotton clothing and towels, as well as garments made from synthetic fibers, even longer. Kaori Tsuzuku (Long-Lasting Fragrance) TOP plus displays superior deodorizing effectiveness. This is due to the plant-based, high-detergency ingredient MEE2, which effectively removes unpleasant odors derived from sweat and sebum. Kaori Tsuzuku (Long-Lasting Fragrance) TOP plus is more concentrated owing to its high-density MEE formula. As a result, each compact bottle provides the same number of uses as the regular type. Leaving a minimal amount of detergent residue on fibers and featuring effective foam dissipation properties, only one rinse cycle is required when using this product. These features not only enable fragrances to remain on fibers more easily-allowing for more enjoyable scents-but leads to greater water and electricity savings. Kaori Tsuzuku (Long-Lasting Fragrance) TOP plus displays superior fabric softening capabilities based on its blend of plant-derived softening components, making clothing fluffy and soft. Sweet Harmony: Blended with natural, high-quality fruit oils, this lightly sweet fragrance is a mixture of peach and juicy, luscious orange scents. Fresh Camomile: This clean and relaxing scent is blended with natural, high-quality, Hungarian chamomile oils.